The Goss Family Travels to Gillespie Field | GossHawk Unlimited, Inc.
On Friday May 31st, 2013, Dave, Connie, and Lindsey Goss took off with the Privateer headed for the Gillespie Airshow in El Cajon, CA. 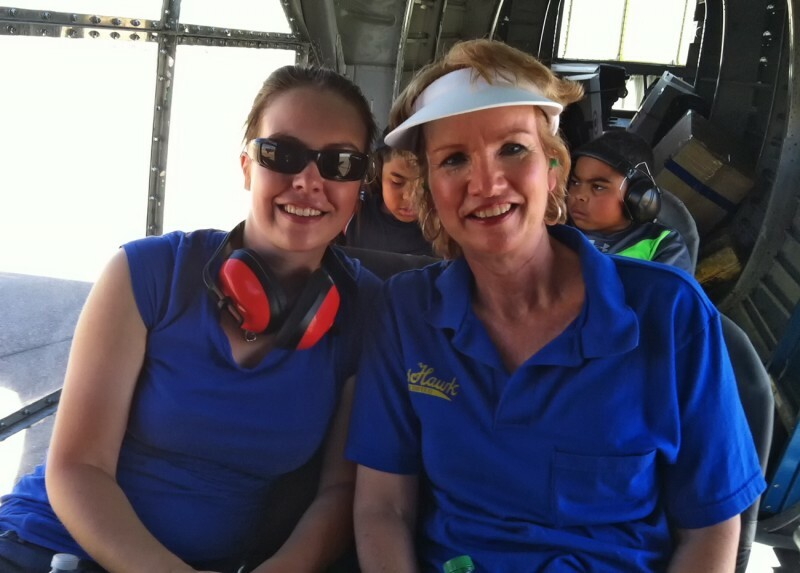 Lindsey enjoyed her first flight in the PB4Y-2, she even got to co-pilot for a while! The Goss family had a fun filled and packed trip! They were able to spend some time with California friends, meet new people, spend time with the client they traveled with and be available to help with the Privateer, visit with their NA-50 client, and Lindsey was even able to show off some of her new marketing materials! The Gillespie Airshow is an annual event held in El Cajon, CA at Gillespie Field. Many people gather every year to see these great birds! In addition, planes near and far travel to participate in the show. This year we saw a Consolidated PBY Catalina, a Ryan STM, a Ryan PT-22 Recruit, a Ryan L-17 Navion, a Douglas C-53, a Vought F4U Corsair, a Grumman F6F Hellcat, a Grumman F8F Bearcat, a Grumman F4F Wildcat, a North American P-51D Mustang, a Bell P-63 King Cobra, a Vultee BT-13 Valiant, the world’s only flying Northrop N9M Flying Wing, and many more! In addition to these great birds were of course the Consolidated PB4Y-2 Privateer and the NA-50, both maintained by GossHawk Unlimited, Inc.
Connie and Lindsey Goss prepare for their first take off in the Privateer. Lindsey Goss listens as pilot Woody Grantham explains the instruments. Lindsey Goss co-pilots the Consolidated PB4Y-2 Privateer traveling to Gillespie Field. Dave and Lindsey Goss under the wing of the Privateer marketing at the Gillespie Airshow. The Goss family returns home after a packed two day trip to El Cajon, CA; you can see that GossHawk blue in the waist windows of the Privateer!